Planet Waves Micro-fiber Polishing Cloth is a long lasting cleaning cloth for all instruments that can be used with or without polishes. Planet Waves Micro-Fiber Cloths traps particles deep inside its fibers which are 2000 times finer than a human hair. This eliminates the need for harsh cleansers. 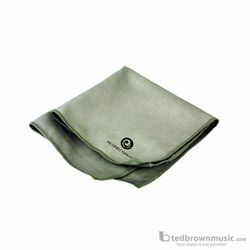 Planet Waves microfiber cloths last considerably longer than ordinary cloths, and can be washed multiple times for lasting, repeatable performance you can rely on.